Not everything goes as planned. You study something, follow the directions, and you find your end product is a total flop. I always think it important to refer to them as "learning experiences" and to try and find something positive despite the lack of success. Do you recognize this formula? 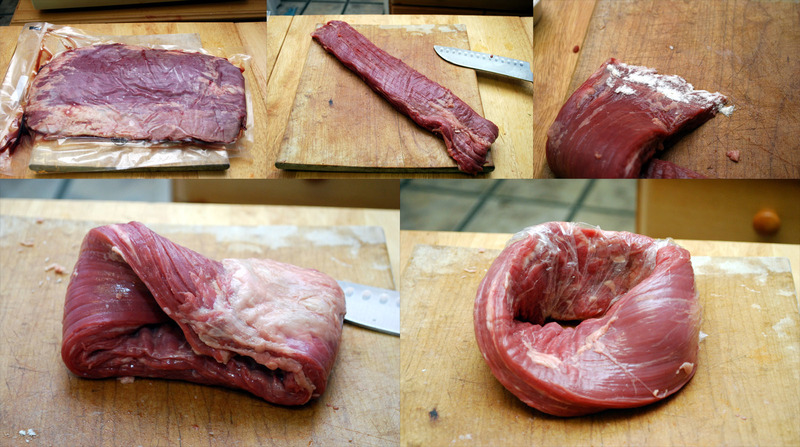 Why not make a möbius strip out of meat? The awesome folks over at RareCuts still had a solid supply of meat glue, so I thought it might be fun to give it a go. I picked up some flank steak from there, since it was a nice long cut, and went about trimming and fashioning the shape I needed. I trimmed the meat to a nice long strip and beveled the ends that would be connected. Next I sprinkled on some of the transglutaminase, then pressed the ends together. (Almost immediately you can feel the bond being created.) Next I wrapped it in plastic wrap and put it in the fridge to set overnight. ... but as soon as it hit the pan the bond broke. Someone informed me that flank steak has large muscle fibers that swell when cooked. Even if it had a good bond, when the muscle fibers swelled it just tore apart the bond, much like Chris Farley putting on a little coat and flexing. Trimmed, glued, sealed. (Note the glove: transglutaminase can be sticky.) I had two skirt steaks to try out. I was thinking that maybe some added pressure would help make a stronger bond; sadly, I ran out bags for my vacuum sealer so some Ziploc bags with a weight on top would have to do for now. After a day, I rubbed them with some salt and the same herbs de Provence blend I used for the meat sphere. I used some olive oil I had that infused with cardamom, lavender, and juniper. And it held! Or at least I thought. The minute I started to divide the möbius strip, the bond began to fall apart. In an effort to still demonstrate the results of dividing a möbius strip made of meat I forced a bond: let's say it was with something inedible that was later discarded along with the meat pieces of meat it was touching. I think that bond might've held had I put more pressure at the site of the bond by vacuum packing the cut of meat, but I couldn't afford to keep trying this. After three attempts (one flank steak, two skirt steaks), I decided to put this one to rest with an assumption that I could possibly do this if I were to give it another try. Great post! I love how you used math and food - little sad it didn't work, next time!! Good stuff bruddah, I like the concept and narration of learning from the mistakes. Cooking the möbius in a "sous vide" fashion, using the oven and water bath might work, then searing only for color and taste as opposed to internal temperature. Stop by the restaurant when you get a chance. Cheers! Ha! What an awesome idea! Too bad it wasn't fully successful, but you get an A for effort :) I really want to see that transglutaminase in action- you should take a video. What's next? Pi out of pie? Just cut it out of a larger meat block in one piece, i suppose? The second I read Möbius Steak and transglutaminase I knew exactly what your trying to do. Brilliant idea! I know you don't consider it a success but this opens a whole new can of whoopass! Even if it worked, you'd have to contrive a new cooking method as so many require flipping from side to side. The topology of such a steak would be highly inconvenient! The way I tried to cook this was to basically set it in the pan and rotate the strip around. I know that doesn't make sense, but if you make a strip out of paper and press down on it loosely with your finger onto a table top, you can pull it along so eventually the entire strip has touched the table. Someone also suggested cooking it sous vide, but I would still have needed to sear it. Since this was a skirt steak, all it really needed was a sear so this worked fine, I suppose. For more info on Mobius Shepherd go to: http://www.reverbnation.com/mobiustheshepherd or http://www.reverbnation.com/thoughtprocess ... Thanks for your support and keep cooking delicious foods!! Could you sear the steak first then "glue it" then sous vide to rewarm?